This fast and easy Chicken Parmesan Recipe is a classic American favorite and makes a perfect meal. Parmigiana is a Southern Italian dish from Sicily, although the name often causes it to be confused with the Parma cuisine of Northern Italy. Parmigiana is made with a thinly sliced filling, layered with cheese and tomato sauce, then baked in an oven. 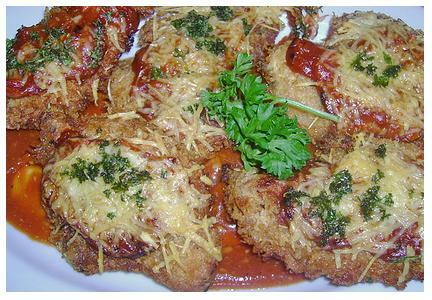 The recipe is often made with breaded meat cutlets like chicken, pork or veal. Other, similar Chicken Parmesan Recipe ideas include the same dish made with added vegetables like eggplant, cauliflower, carrots, or zucchini. Almost any of your favorite veggies will do. Or you can just skip the meat altogether and bake Veggie Parmigiana. In fact, authentic Italian versions of this dish are always vegetarian. Here's a quick and easy recipe for Chicken Parmesan as we know it. Whisk together the egg and the milk. Lightly coat each chicken breast with flour. Dip each chicken breasts in milk and egg mixture, then cover each one in bread crumbs. Heat the olive oil in a large skillet over a medium-high heat. Brown the chicken in the hot oil on both sides until golden, about 3 to 4 minutes on each side. Set the chicken breasts aside in a baking dish. Put three slices of mozzarella cheese on each chicken breast. Mix the tomato sauce with chopped fresh tomatoes, sugar, basil, salt, pepper, and garlic. Pour the sauce over the chicken breasts, and sprinkle with Parmesan cheese. Bake at 350° for 25 to 30 minutes, or until bubbly. Serve with spaghetti or garlic bread and a nice green salad with Italian dressing. See this page for Affordable Travel Deals to and from All 50 States. Go here for a complete list of Universities and PhD Programs in All 50 States. Hit this link to learn How to Work From Home Anywhere in America. Click here for Factory Outlet Malls all over America. Find the Cheapest Car Insurance Company in All 50 States.